I have so many Safari stories to share with you from my Safaris in Botswana and South Africa; two amazing Safari destinations and each so unique. I am so excited to have explored these country so I can now tell you first hand why you too should go on Safari here. My first stop was Botswana and I have fallen in love with this country so here goes with my …. Top 5 reasons to visit Botswana on Safari! 1: Okavango Delta and the surround marshes. 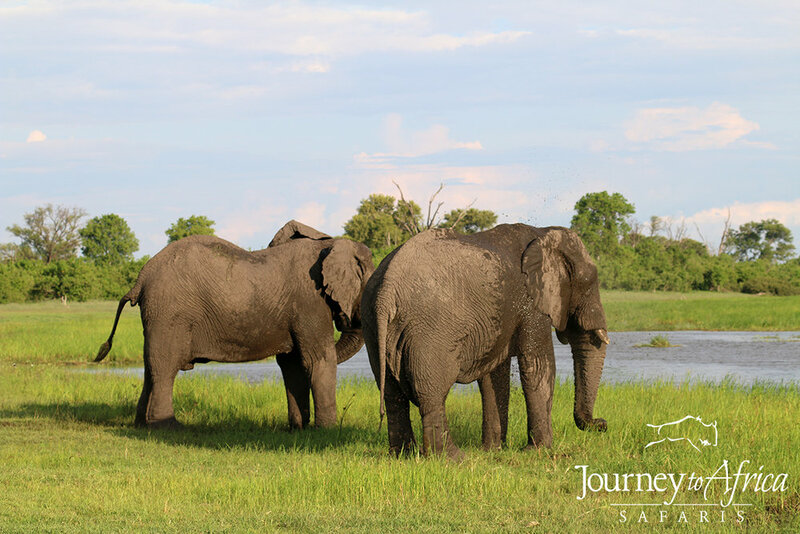 If you love wildlife, you know you have the Okavango Delta on your must-visit Safari area in Africa. Well, I am so fortunately to say I have been and it did not dissappoint. The Okavango Delta floods usually from June onwards to October when the water arrives from the rains in Angola. In February, it was still dry and hot [the permanent channels and river had water but they will fill out to the brim once the water arrives] but wildlife viewing was spectacular in the many different areas of the Okavango Delta and it’s surrounding. I saw 3 packs of wild-dogs, huge elephant herds with lots of babies, beautiful lion prides with lots of little playful cubs, leopards, birds and so much more. Wild dogs so close to the vehicle from Kwando Splash. By the beautiful channel near Machaba Camp in Khwai concession. A stunning morning with these cuties from Kwando Lebala. There are many options of enjoying water activities because of the permanent water channels and rivers. I had a sunset and sunrise water activity almost every day from the different lodges I visited. Sunset cruise was on a big boat with a roof [you can see me sitting up here when it was my time slot] which was lovely. Then, mokoro. All Botswana Safaris photographs you see show you a mokoro, which is a canoe boat that was used as a mode of transportation. Well, I did a few of these and the verdict - worth it. It is calming yet checks your fear meter [hippos close by], and each guide has their stories of how their parents taught them to ride, using the mokoro to get from the village to town, usually Maun - the gateway town in Botswana, or how they went fishing on the mokoro. Some riders still use mokoros in their villages. In some lodges, the mokoro rider is different from your Safari guide - fun way to get to know more Setswanans. The mokoro in the Safari land is made of fibreglass so no tree has to be cut but in the old days, it was carved out of large tree trucks. Sunset cruise from Kwando Splash in private Kwando concession. Ailin and I with our fantastic Kwando guide Joseiya on a mokoro in Kwando concession. Mitre, my fantastic guide from Gomoti Plains scanning. 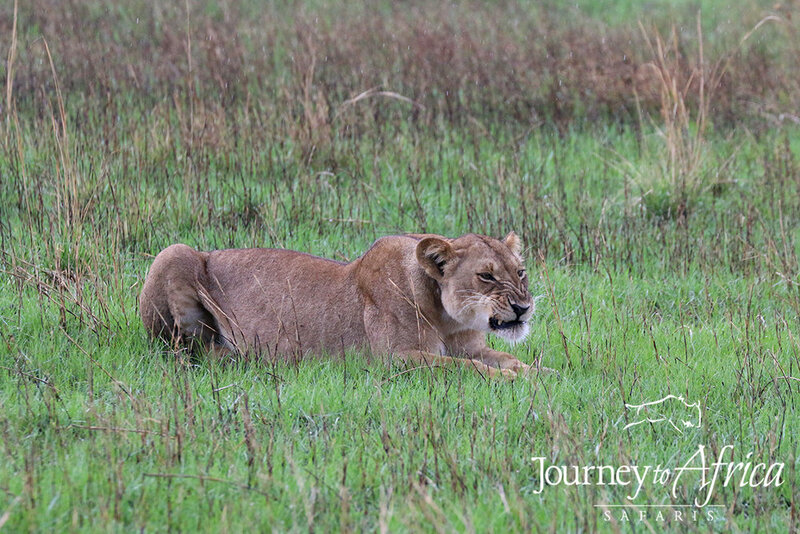 We were so close - we saw the male lion eating a whole impala - nature! Because again these areas are private and only a few number of lodges, you have the advantage of controlling the number of vehicles you can have in the area and the guides are part of the the company hence same standard of guiding. If you are enjoying a sighting, another 3-4 vehicles will be with you but really, no more than that. You also have the unspoken rule of sharing [they said around 3-4 vehicle per sighting] so if you have been with the sighting for say 10-15 minutues, you offer the courtesy to the other vehicle to come and enjoy the sighting while you leave and look for your next adventure which is always around the corner. Baby leopard and mama seen early in the morning from Machaba Camps with my amazing guide Moreri. Black backed jackel showing lots of loving from Kwando Lebala. Love Kwando Lebala. A yellow-billed hornbill - spotted from Kwando Lebala. With a lot more water channels and rivers, you have aquatic antelopes like the red lechwes. Such beautiful animals splashing back and forth. I spotted a not so commonly seen situnga on my sunset boat ride from Kwando Splash camp. My guide Joseiya and Kwando rep Ailin were so excited - I had to come back and Google situnga to realize I did spot something rare. Birds like lesser jacana was also seen but it flew away before I could capture it. 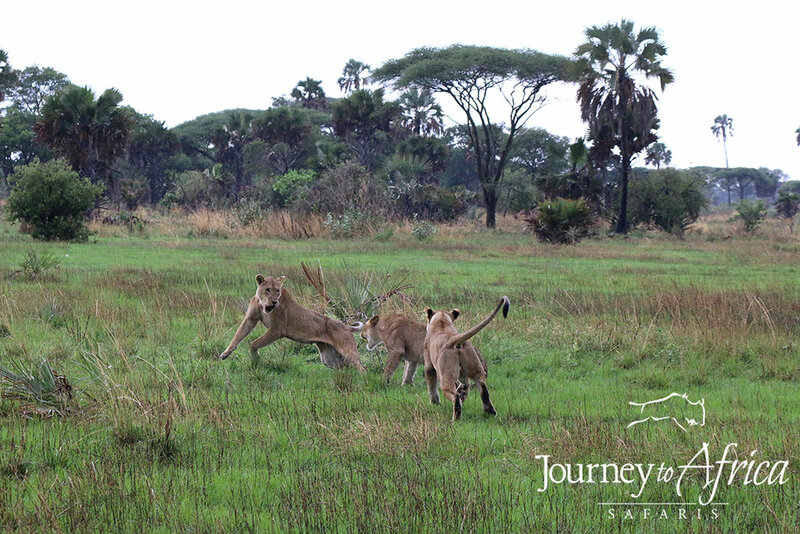 The beautiful Red Lechwe jumping the Linyanti Swamps from Kwando Lebala. The rarely spotted sitatunga - a water antelope from my sunset boat cruise from Kwando Splash. So would I say go on a Botswana Safari, a loud Yes! Amazing people, great Safari lodges, and spectacular wildlife in a country who have done a fantastic job of conservation. With 45% of the land set aside to wildlife and low human population, Botswana, you have something really special to offer. Let’s chat about Your Safari to Botswana! 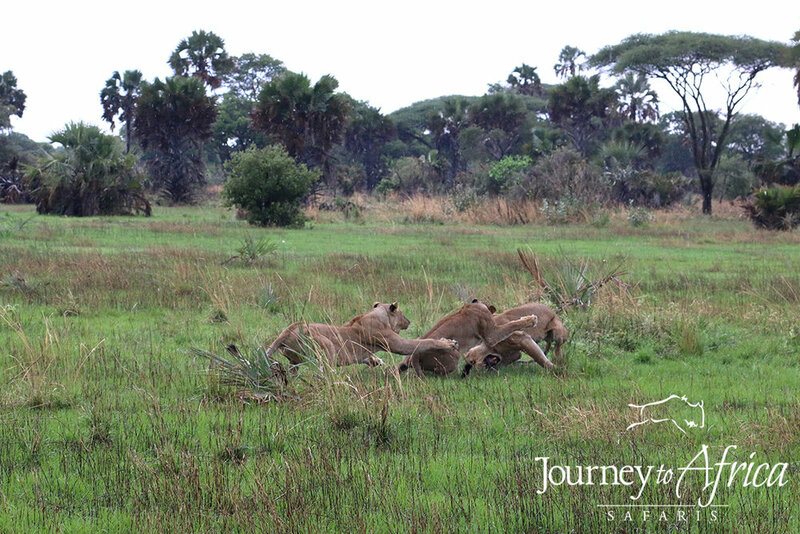 If lucky, one of the feelings you will experience on Safari is the slow pace. A wonderful feeling, really! 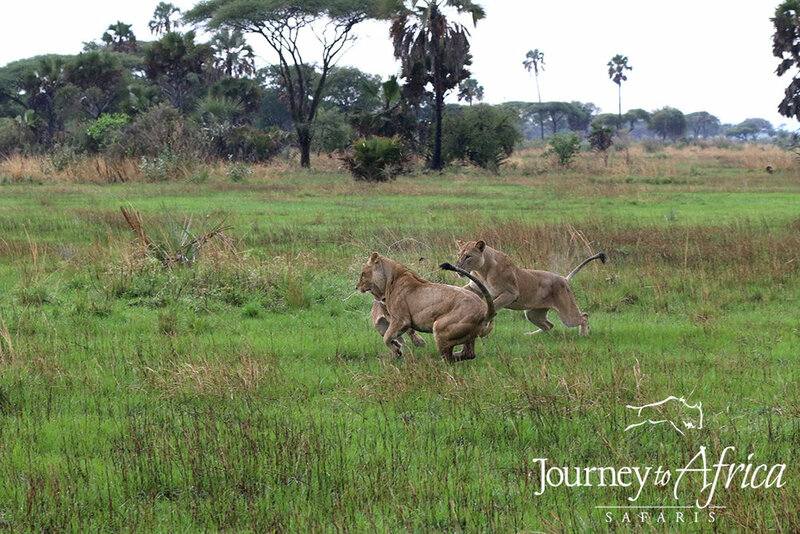 There is a sense of routine that forms on Safari. Since the staff will take care of everything for you, it allows the luxury of this relaxed, laid back feeling to sink in so you can really take in the incredible, natural surroundings. For example, you have your day planned by your guide and Safari lodge [thanks to all the planning you and I will do before you get to the ground], you are 'driven around' in your Safari vehicle, meals taken care off, activities arranged, etc. You can allow yourself to surrender in these wonderful places. You are detoxing from the hustle bustle of your day-to-day. Dip in Lake Tanganyika, after a trek to see the chimps. Photo taken by Julien Polet, the manager of Greystoke Mahale at the time. Three ways to enhance that for yourself. Take time to enjoy the park. To really get the feel of the park or a corner of the park, make sure to settle in. Unpack your bags and spend at least 2 nights in each of our lovely lodges so you can really sink in that vastness of the terrain you have the privilege to explore. Most of the parks in Tanzania and other countries in Africa are huge. Give yourself time to dig deep into the park and you too will start feeling like you are 'at home'. Decompressing takes time; stay at least 8-9 days. I may not be too far from the truth when I say our lives are on the run. Whether you are a family with young or adult kids, a couple, or even retired, we travel to escape. The first few days on Safari, you are still getting in the groove of how to relax ... or at least that is what most of us feel. Then we slowly start putting the phone away longer and are not craving for wi-fi. Your body is learning to relax. The game drives start become more enjoyable; you are decompressing. One of the reasons you are taking a Safari right? 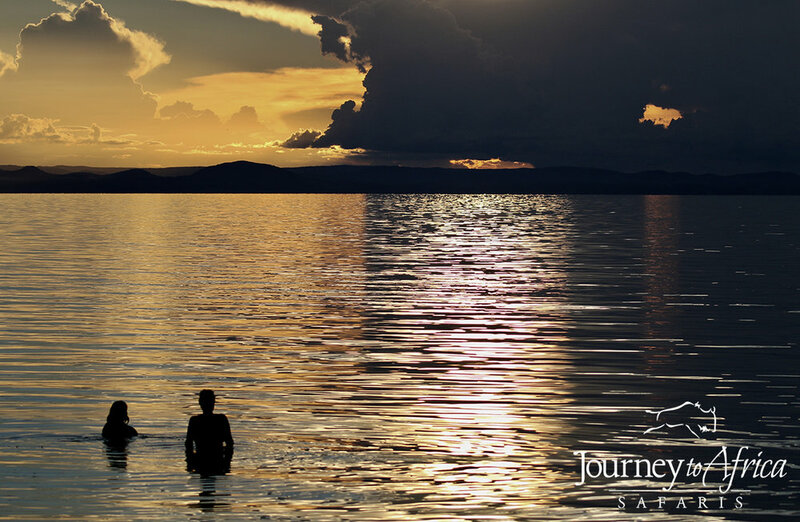 The longer you spend time with your guide, the lodge crew, the other travelers you will meet on Safari, your family and friends, the deeper the connections that will start to form. So much fun if you can open up and chat with your Safari mates. One of my favorite things on Safari is to chat with the guide and lodge crew. Tanzania has over 100 tribes and each one has an amazing story to tell. My Lost in Translation blog post came from my time chatting with these knowledgable guides. I still keep in touch with many of them. They have taught me a lot. My Tanzania with Mefi Safaris have been that - amazing experiences which have created lifelong friendships because we have had 10+ days together and we continue to travel together. Evening game drive in Ruaha. You can't help but appreciate the vastness, the silence, the unknown. The #traveldeeper hashtag - that's what we want you to achieve. If you can afford to give yourself the time and depth of slow travel, do it! I look forward to being on Safari [or any trip] so I can slow down the pace of life. Ready to enjoy some slow travel time on Safari? We can make it happen. "Tanzania is definitely an exception." When Matt and Ashley D. contacted me to plan their 10th anniversary Safari, they had one request. They wanted to spend time in Oliver’s Camp. Why? Their friend John H. had recommended that Safari lodge. John H. and I met randomly at Oliver's Camp in 2009 while having dinner in the family style table. A friendly chat lead to us keeping in touch for all these years. The Deel's Safari was super fun to plan. And I managed to surprise them with a few anniversary treats. "THANK YOU SO MUCH for planning our amazing anniversary trip. We’ve traveled to numerous countries over the years and I always say “I don’t like going to the same country twice because the world is so big and there is so much to see”, but Tanzania is definitely an exception to this rule! It is such a beautiful country with wonderful people. I can’t wait for our return trip and I hope to bring along friends and family so they can experience all Tanzania has to offer as well. Thank you again for making this exceptional vacation happen! - How was your time with Fazo? Fazo was exceptional!! He was courteous, professional, knowledgeable and so much fun. We enjoyed getting to know him, laughing with him, and enjoying a beer at the end of the day with him. He truly cared for the land, animals, and people. He was patient and kind, he not only cared about us and our experience, but he also cared about the other camp guests and wanted to ensure everyone had a great safari experience. One safari guide staying at a camp with us was new to the area and didn’t know his way around very well. Fazo was disheartened to hear that those guests didn’t see the same animals and have the same great experience as we did during the day, so Fazo very politely spoke with the resident camp guide and the new guide and helped make sure the guests had a better experience the next day. He privately took the new guide under his wing and gave him advice, while not speaking down to the new guide or making him (or his guests) feel uncomfortable. This is only one example of Fazo’s passion for his job and his country. We told Fazo that he is welcome in our home if he travels to Florida, Missouri, or Kansas. - Did you enjoy your Safari experience? Wildlife, birds? We absolutely enjoyed our safari experience. The wildlife, birds, bugs, and insects were all amazing (yes, I even took pictures of the dung beetles). I also really enjoyed the people and the culture. Seeing and visiting with the Maasai was definitely a highlight. - Any favorite story/ stories? 1) We really enjoyed meeting a Maasai boy outside of the Ngorongoro crater that Fazo had befriended over the years. The boy was about 8 years and an absolute pleasure to meet. As we were driving I saw a small boy in the distance sprinting across a field. After a few twists and turns in the road we came upon the area where the boy was running to and Fazo noticed that the boy happened to be his friend (the Maasai boy had recognized our car in the distance). We stopped and visited with the boy for about 10-15 minutes and I definitely consider this to be a highlight of our trip. 2) A favorite was also the late afternoon game drives when Fazo packed a few snacks and a couple beers. 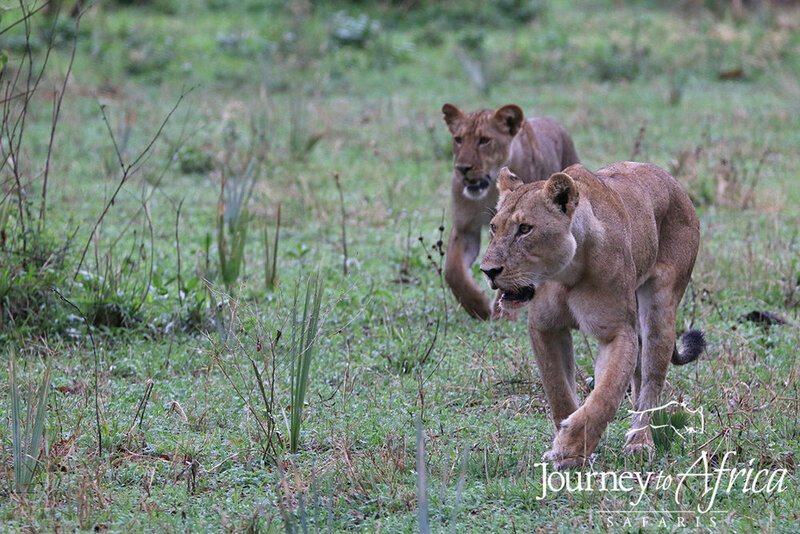 Happy Hour in the bush watching a lioness and her cubs play is hard to beat! 3) The staff’s recognition of our anniversary was also great. We had a surprise sunset bubble bath and champagne at Oliver’s Camp (we didn’t even know our room had a bathtub!) and we also really enjoyed the celebratory dancing and singing with cake and champagne at Olakira. Such unexpected treats! Thank you, Mefi for coordinating the celebrations. 4) Having Fazo tell us about the baboons that jump into cars and steal food, then to witness it firsthand a few minutes later when another guide failed to close down the roof before parking. 5) Seeing an elephant in the crater get upset at a safari car and charge the vehicle. Luckily Fazo was always watching and paying attention because he promptly started our car and zoomed down the road so that the car behind us (the one the elephant was charging at) didn’t run into us. 6) We enjoyed learning about Fazo and his family. His volunteer work protecting the wildlife, his avid volleyball playing, his wife and children, his knowledge of sign language, his support of the deaf community, and his love and respect for the people and animals within his country. 7) Having Fazo ask us questions about where we grew up (rural Missouri and Kansas) and his surprise that we had dirt roads and how similar the views of the Kansas plains are to the Serengeti plains. - What about the Safari Lodges? Did you enjoy your time here? All of the lodging was great. Oliver’s Camp and Olakira were our favorites because we enjoyed the camping experience, but all of the accommodations were fabulous. - Was Zanzibar enjoyable? Did you enjoy the Stone Town and Spice Tour? Zanzibar was beautiful! During our one full day there we went on a snorkeling tour that included lunch on a private beach (coordinated through Matemwe Lodge), it was a great way to spend the day. We weren’t sure what to expect from the Stone Town and Spice Tour, and to be honest we weren’t really looking forward to them, but they were great and I am so glad we went on them. 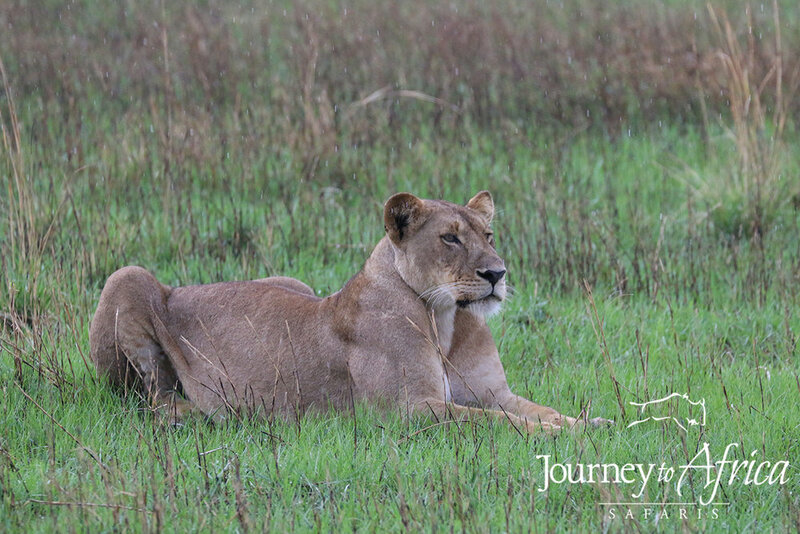 We learned so much on the tours and we enjoyed seeing another side of Tanzania. Our Zanzibar guide was very knowledgeable and the tours were fantastic. - Any suggestions for us for future clients? Any improvements we can make? A suggestion for a future client would to bring more long, moisture wicking dresses. I only brought two and I wore those more than anything else on our trip. They kept me cool and comfortable on game drives and in the evenings when I wanted to dress up a little I wore them with my wedges (not that dressing up was ever required). " See you back on another African Safari with your family.